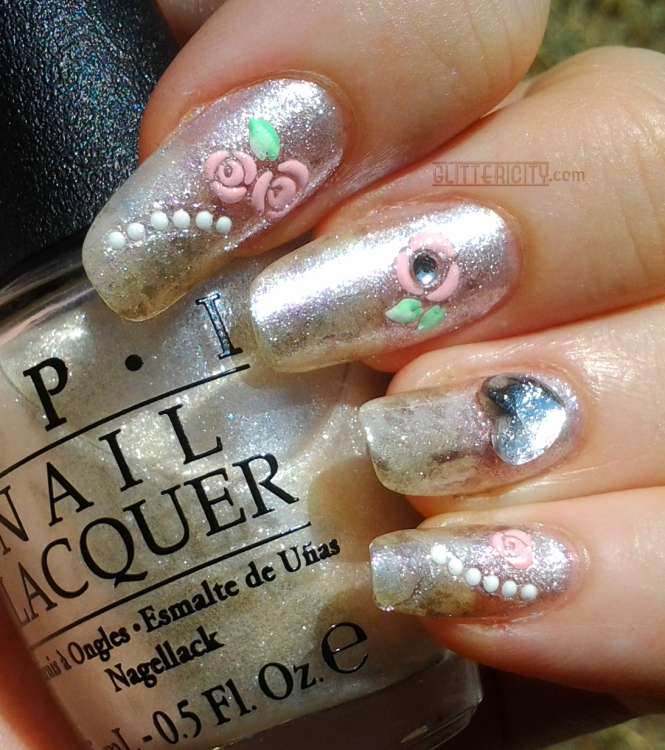 For my final love-inspired mani, I wanted something soft and wedding-appropriate. (No, I did not get married nor attend a wedding today--just went for the look!) I also tried to make it sort of symbolic. I'll explain how! 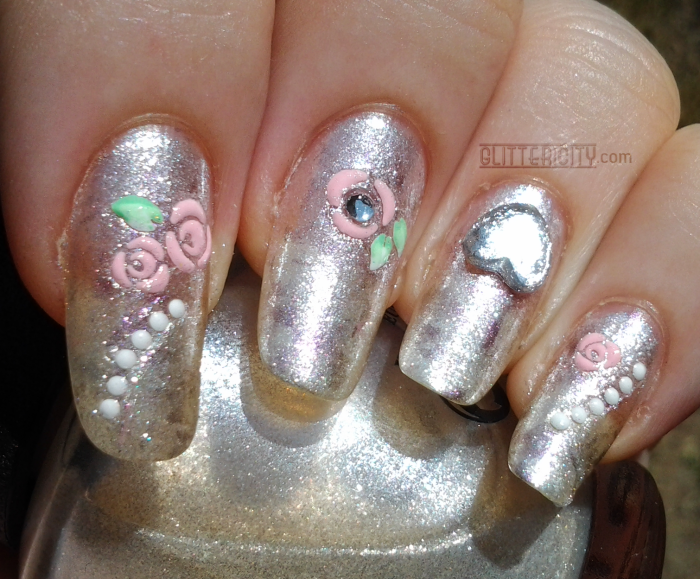 For the base, I chose OPI Happy Anniversary!, the shimmery white pearly polish shown in these photos. I suppose the reason is obvious. Love, and especially marriage, should be long-lasting and with many happy anniversaries :) To feel "in love" is one thing and should be the case most of the time, but to commit to loving a person even when things are tough is entirely another. But romance is also about desire, and fulfilling certain needs only with your chosen partner, forsaking all others, To represent this, I used the saran wrap/cling film method (great tutorial from the creator of this technique here!) to dab on some of Deborah Lippman's Private Dancer. Keep their eyes on you! A photo indoors with flash. Next, the decorations! 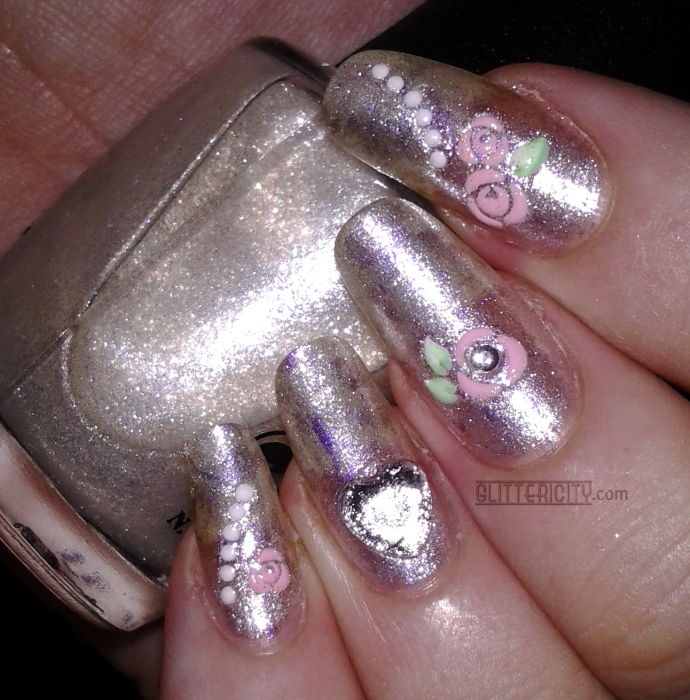 I chose these sweet rose decals from Cina Pro. Roses are, of course, the classic flower of romance. But I also wanted to represent the ongoing nature of love. A relationship is not something you acquire, tick off your list, and move on from. Just like a flower, it needs attention and nutrients to grow. How often do you hear that a couple just 'fell out of love', or 'grew apart'? "Nothing really went wrong", they say, "it just wasn't working anymore." I believe this often happens because the partners stop trying to impress and woo each other, stop going the extra mile like they did at the start, and the garden of love slowly wilted. Water your "flowers" every day! And last, the accent nail. 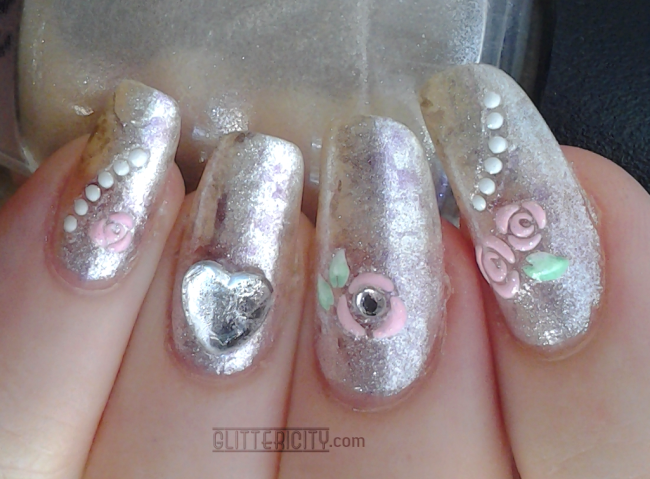 A big blingy diamond heart rhinestone! (I believe this was in a random pack from a craft store.) The meaning behind the heart shape is obvious. I know there is a lot of controversy about what a diamond means and whether it should be used and etc... but traditionally, to me, it has represented the purity and rarity of real love. Also, as the hardest known mineral, it shows that it is nearly impossible to break or shatter, and a couple should strive to not let the little stresses of life tear them apart. Topcoated with INM Out the Door. And one more sun pic, because, shiny. Look at that rhinestone sparkle! So that's it for today's post. I hope you liked the manicure as well as the thought behind it. I also hope you had a nice day--whether you're single or 'taken', whether you had a special date or it was just another Friday night. Because the best part about love is that you don't need just a romantic partner to feel it--make sure to tell your family and friends what they mean to you! Which reminds me to thank you for reading my blog, and I hope you enjoy it here :) I am thankful for you, and if I can make you smile with my art, that's one thing in life that I love.